19 Days of Jars of Clay: No. 14 Overjoyed. From the album "Much Afraid"
Christian media can be a funny thing. Sometimes it can be really good, like Father Jim Martin's recent post about Pope Francis at Huffington Post, or this post about the Interfaith Movement at Focus on the Family's site But sometimes it can be downright puzzling and annoying. Now, expecting every article online that purports to be Christian to live up to that label is silly. You're going to find outright lies in some cases, and in other cases, well meaning folks that just don't get it. My focus here leans towards the latter. 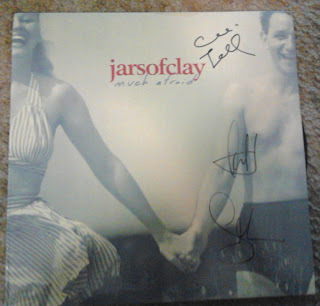 Jars of Clay's Much Afraid album is one of my favorites. More than any other Jars album, this is the one that digs the deepest, yearning for spiritual truth. When I saw them in concert in 2011, this was the album I took with me to get autographed. Only three signatures because Odmark was unable to appear at the show. As a brief aside, I have absolutely no idea how I was able to snag a vinyl version of Much Afraid. I was at a record shop in Little Rock, and found a used copy. It's my most cherished record. Back to spiritual depth, it truly is a heavy album. In a blog post that is no longer available, Dan Haseltine said that he battled depression while this album was being recorded, and that it took him quite a long time to go back and listen to it. "After reading your blog, I am very humbled asking you to sign this," I told him when he autographed the record. So this album does a lot of soul searching. It reminds me of the book of Psalms, where David would pour out his heart to God, desperately searching for meaning and something beautiful in this life. So it was very disheartening to read the review of Much Afraid at Focus on the Family's Plugged In site. The author of the review writes, "The weary traveller is well represented, but the abundant joy of John 10:10 is not-just abundant soul-searching. That's fine if the band wants secular listeners to know that it empathizes with their daily struggles. And as a pop album, Much Afraid is a winner. But Christian teens expecting edifying answers to these same deep questions will need to look elsewhere." For a kid who was absolutely devastated and broken due to his parents going through a divorce, this lyric meant the world to me at the time. Hearing Jars of Clay sing "Thoughts of peace can overcome anything." gave me so much optimism. This music (as we'll see again later in this countdown) gave me those answers I was looking for. Thoughts of peace can overcome anything. No matter how bad that divorce was, no matter how much my personal life was crumbling around me, thinking of Christ's peace will help you overcome those struggles. Is it silly of me to pick a fight with a review that's been published for more than 15 years? Probably, although the fact that it is still available makes my criticism fair. It made me wonder if the author had ever cracked opened the book of Psalms, because he'd find "abundant soul searching" in that book. Thankfully, I was a Christian teen that had a great extended family to lean on, and a church family that loved me and helped me get through my parents divorce without falling to pieces. And thankfully, I had great music to pass the time, to help me when I was Much Afraid.